Environment Secretary Owen Paterson is leading a trade delegation to Paris to boost British food and drink sales in France. British produce has been getting more popular with the French in recent years, and Mr Paterson believes we can sell even more of it. Since 2000, UK food exports to France have doubled from £1.1 billion to £2.2 billion, including four times the sales of cheese such as stilton and cheddar, and triple the_ _sales of whisky and beer. English sparkling wine is also rivaling Champagne in top awards and is increasingly served in leading Paris restaurants. The delegation will tonight promote British food at a “St George” reception where “les Rosbifs” will serve traditional roast beef to French food importers. Tomorrow Mr Paterson will meet the French Food Minister and accompany British producers to SIAL, the world’s biggest food trade fair. Food and farming is worth £89 billion to the UK economy and employs 3.5 million people. Last year UK food and drink exports increased by 9 per cent to £18.2bn, marking the seventh consecutive year of record growth. In January Defra launched the Farming, Food and Drink Exports Action Plan to help more food and drink companies venture into overseas markets. 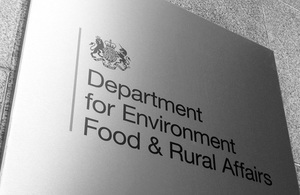 In May Defra helped secure a £50 million agreement to export British pork to China. The St George reception is organised by EBLEX, the levy organisation for beef and sheep meat producers in England.